Both models feature a primer and powder-coated finish, are DOT approved and include all signal and marker lights. The FVNP trailer has a single axle with 15" rims and radials. 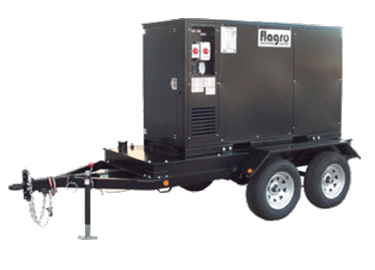 The FVO trailer has a dual axle with 15" rims and radials and includes second axle brakes. On-board 180 US gallon tank with 110% containment is included. FVO has a 30-hour run time at constant fire with no thermostat, a tiger loop fuel draw and priming systems standard, a 4" C-Channel framed to protect the fuel tank and a 4" spout with anti-splash insert. FVO and FVNP heaters feature a 130º F temperature rise at 7,000 cfm, created by reverse inclined blower. They are ductable up to 200 ft. and equipped with VFD controls, allowing for a soft start, which regulates fan speed, power and power draw on start up or shut down. 1 phase and 3 phase, 208-230V power supply connections are standard and both models are equipped with dual 16" inlets and outlets. 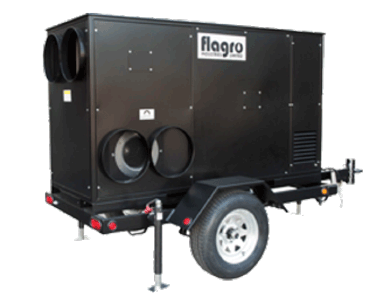 The proven Flagro heat exchanger design includes fully welded, 16 g 304 stainless steel. 4.5x60W @ 160 psi Propane - 1.5" W.C.
Natural Gas - 2.2" W.C.